A detail of a work in progress by Bharti Kher. 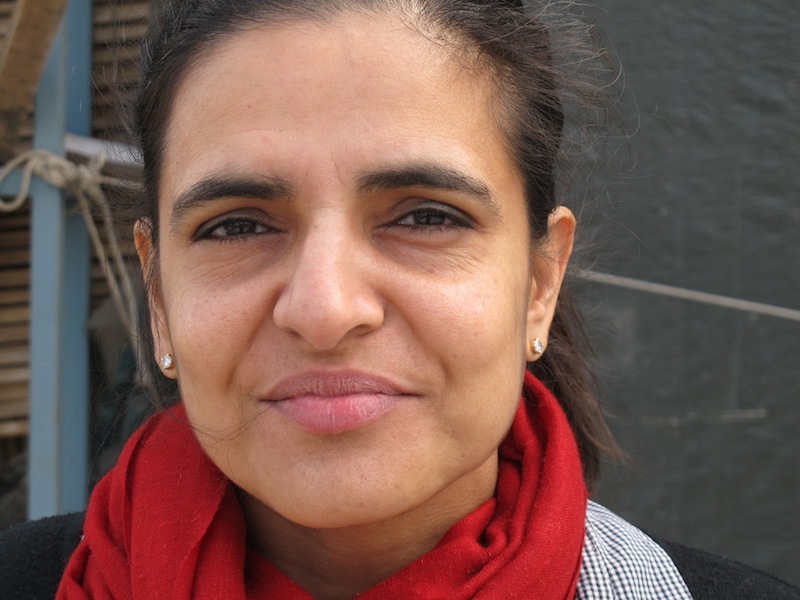 Walker chief curator Darsie Alexander is in New Delhi for the India Art Fair, which runs January 26–29. This is the first of her dispatches from the road. The India Art Fair, now in its fourth edition, opened to throngs of art enthusiasts a few days ago — throngs being a word that takes on new meaning in India. The place was jammed, shoulder-to-shoulder with curious onlookers, teenage gawkers, and a few curators like myself looking slightly bewildered and overwhelmed by the sheer abundance of art and human bodies, all seeming to press up against one another in a crushing array of activity. 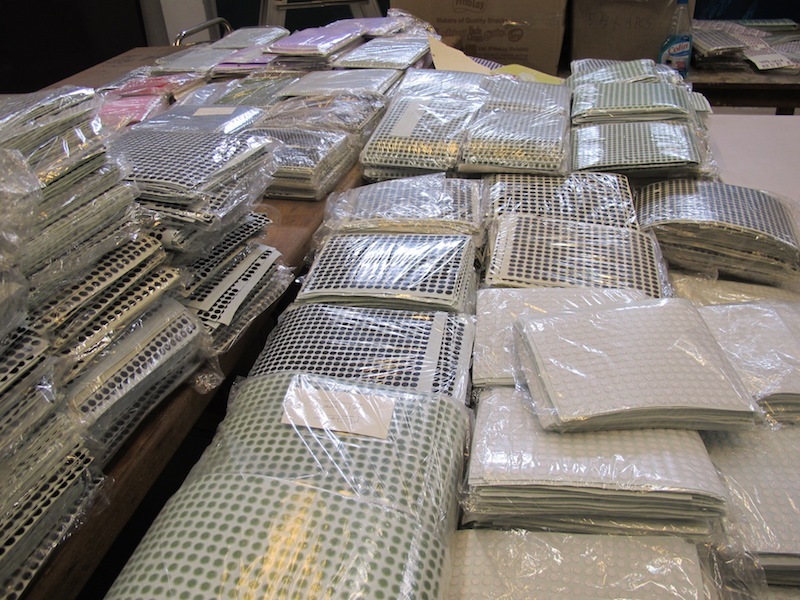 Full disclosure — on this my first day, I barely saw a thing amidst the hundreds of booths. Instead my art fix came in the form of two memorable studio visits. The day started with a drive to the outskirts of Delhi, an area called Gurgoan, where artists Bharti Kher and Subodh Gupta live and work. Married with thriving independent careers and studios, these artists are among the most visible figures from this region, with representation in major galleries and collections around the world. This recognition took time for both, but has resulted in very active, intense studio careers — though their spaces were free of staff today, a holiday here in India. A new work by Bharti Kher. Bharti’s studio is large and welcoming, and our tour began on the upper floors, which overlook fields in an otherwise industrial area. Throughout the building there are finished works and those under development, each at a different stage in its evolution. Much of the work concerns some aspect of the body — including clothes such as scarves and everyday blue jeans, which the artist soaks in a synthetic resin and transforms into static wall-works that have a flowing, almost classical presence (though the garments are undeniably contemporary). 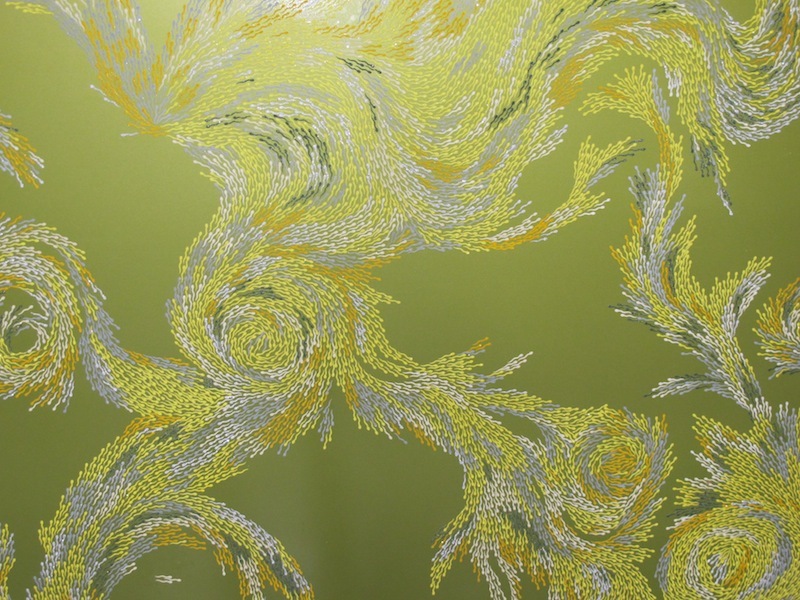 Bharti regularly employs glittery bindi, small adhesive stickers worn on the forehead of many Indian women and said to retain energy and strengthen concentration; shaped like a teardrop, they also evoke sperm or amoeba. Through her practice, Bharti uses these forms in swirling configurations, often overtaking the underlying form in patterns and shapes that range from the aqueous to the ethereal. On the one hand, the configurations appear carefully planned, but in fact the unfold more intuitively. Demonstrating how a path or shape might develop, she brushes her hand across a dusty painting’s surface, leaving a barely visible trail to mark her work for tomorrow. 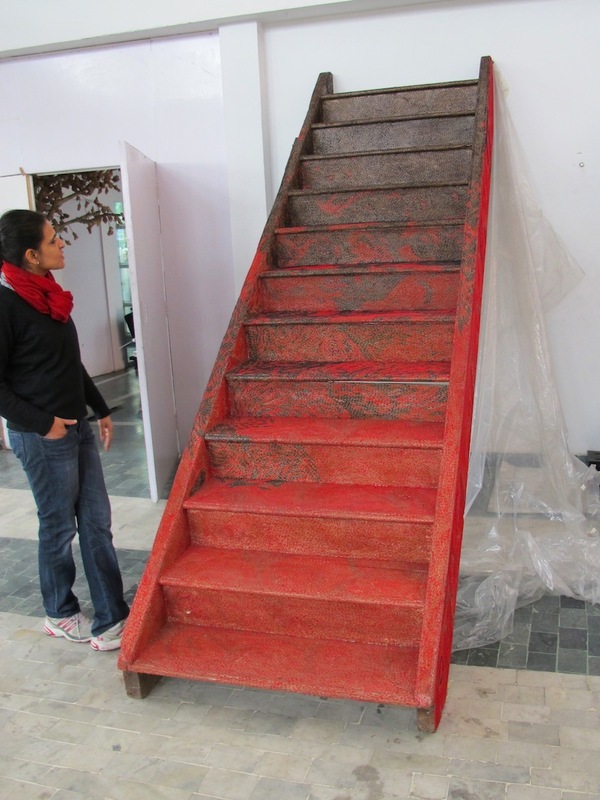 Across the highway (around, beneath, on the other side–getting there was immensely confusing) we found Subodh’s studio, filled with work for the many visiting guests of art fair week. 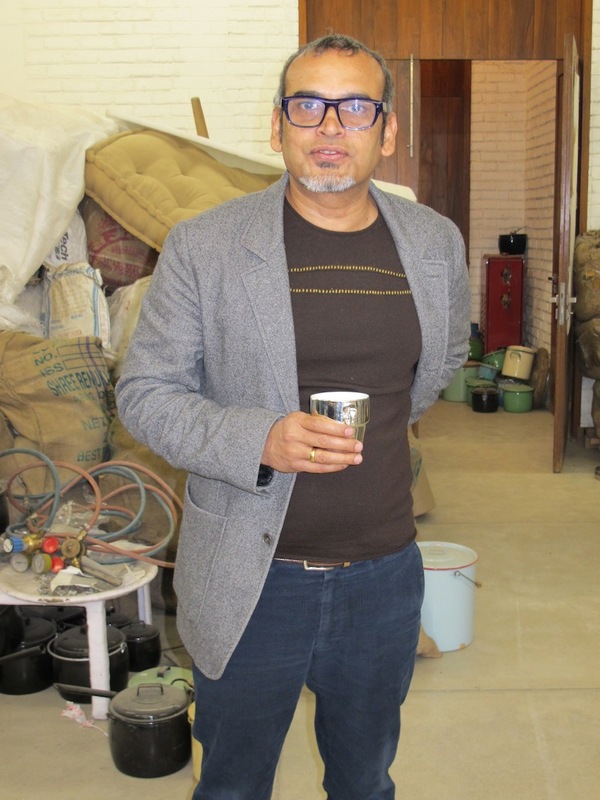 Subodh is best known for his sculptural works comprised of the familiar vessels of Indian cooking–boilers, rice carriers, pans for frying, and coffee containers, among countless other cookware types. As the artist told me, kitchens are as sacred as temples in India, and shoes must be removed before entering both. 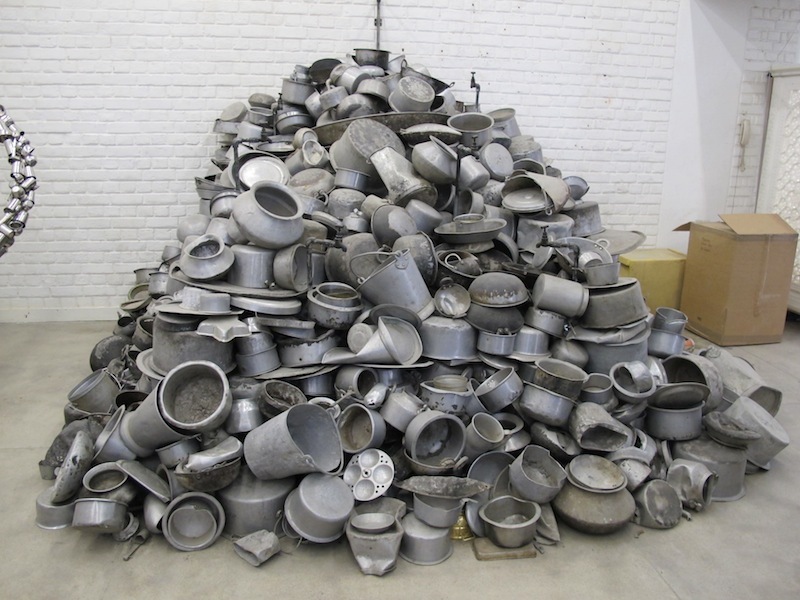 A new "fountain" work in progress in Subodh Gupta's studio. 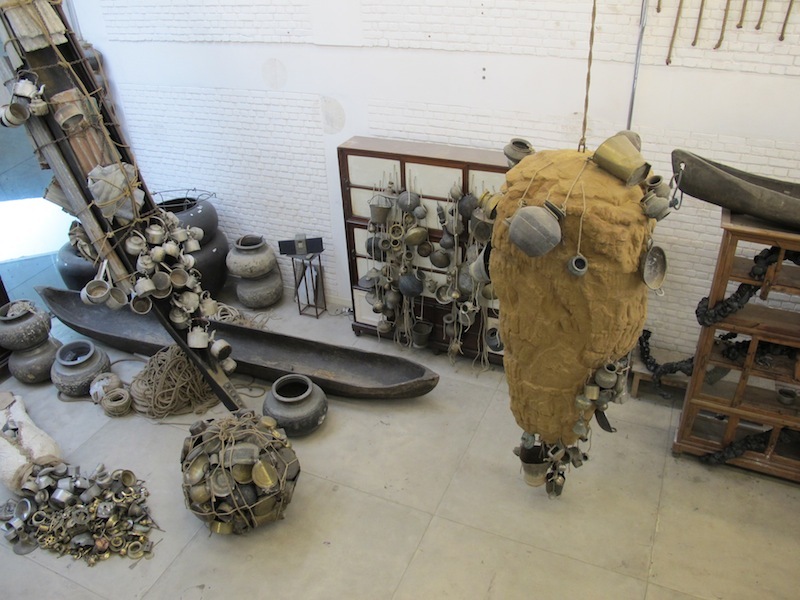 Clearly the space of food and its many vessels have been of abiding creative interest; a new work made of found pots and pans saved from a scrap heap forms a large fountain emanating from one side of his studio. A quick flick of an “on” switch brings the work to life as water tumbles into pans, evoking not only cooking this time but cleaning. And I like the metaphor: fountains like Tivoli mark the grandeur of historic sites (and let’s not forget Duchamp’s very special “fountain”), but this one is of a more humble constitution, emerging as it does from the small tasks of daily life — namely cooking, carrying things around, and eating together. 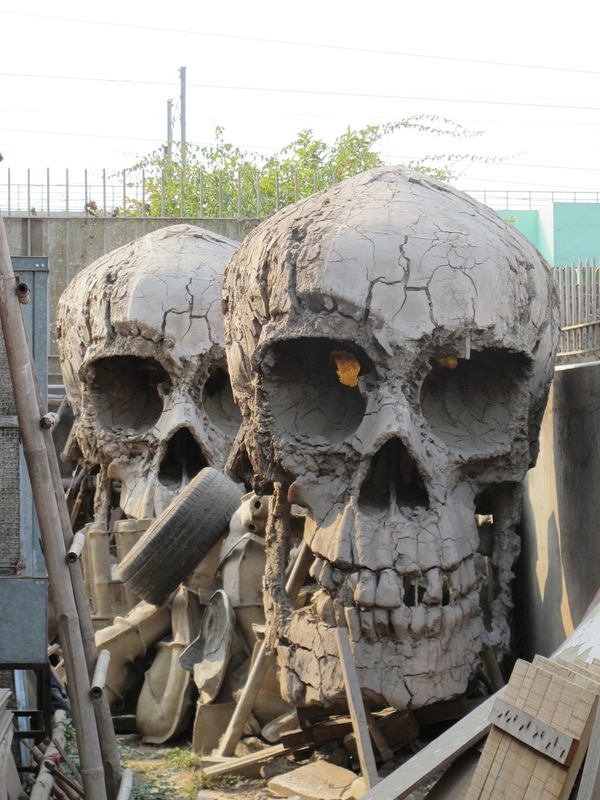 Monsoon-weathered skeletons made of clay and plaster align with a well-known skull series by Subodh Gupta. As the first wave of jet-lag hit (around 4 pm), I returned to my driver-guide to head back to the hotel. To his credit, he had hardly lost his way as we emerged from the city, but getting back was tougher. At a certain point, when a worrisome pattern of weaving through traffic was accompanied by visible head-jerking and nods, I realized that my double-shift driver was struggling to keep awake, as was I. For the next forty minutes, we spoke very loudly and with unnecessarily animated gestures to one another, as we made our way back — safely — to Delhi.